The New York metropolitan area is the city and suburbs of New York City. It includes Long Island and the Mid- and Lower Hudson Valley in the state of New York. It also includes north and central New Jersey, three counties in western Connecticut and five counties in northeastern Pennsylvania. 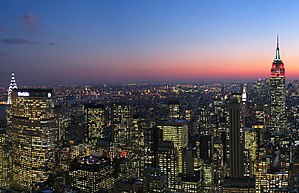 The New York metropolitan area is the most populous in the United States. This includes the numbers defined by both the Metropolitan Statistical Area (20.1 million residents) and the Combined Statistical Area (23.6 million residents). It is also one of the most populous built-up areas in the world, and the single largest in North America. ↑ 1.0 1.1 "Annual Estimates of the Resident Population: April 1, 2010 to July 1, 2014 – Combined Statistical Area; and for Puerto Rico - 2014 Population Estimates". U.S. Census Bureau. Retrieved March 26, 2015. ↑ "World's Largest Urban Areas [Ranked by Urban Area Population]". Rhett Butler. 2003–2006. Retrieved 2011-11-25. ↑ "Largest Cities of the World – (by metro population)". Woolwine-Moen Group d/b/a Graphic Maps. Retrieved 2011-11-25. ↑ "Largest urban areas in the world: 2008 All Urban Areas 2,000,000 & Over" (PDF). Wendell Cox Consultancy. Retrieved 2011-11-25. This page was last changed on 11 July 2018, at 20:54.